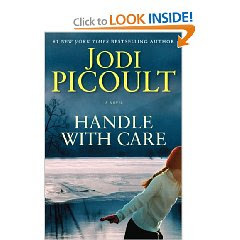 I'm not going to lie - I think Jodi Picoult kind of phoned in this novel, mainly because she blatantly recycled parts of My Sister's Keeper and Change of Heart. I don't know, when I read Picoult, it's always the same - the lawyer with a turbulent past, the family in crisis, a depressing ending - and while sometimes, I like the familiarity, sometimes, it just gets on my nerves. In Handle with Care, Charlotte and Sean O'Keffe have a daughter, Willow, who is born with osteogensis imperfecta, or brittle bones disease. Their financial status is spiraling downward due to high medical costs, so Charlotte decides to sue her OB for wrongful birth - meaning that her gyno should have told her about Willow's condition in utero so Charlotte would have had the option of abortion. Of course, this being a Jodi Picoult novel, Charlotte's OB is her best friend. Despite the intriguing plot potential (the O'Keffe's have another daughter who has A LOT of issues that should have been explored more), again, it's all just the same nonsense - there's a tense lawsuit, a lot of family drama, and a really really unnecessary and contrived ending.